Yeah, compact frame, long post, ...and the hoods are like at the end of a cantilevered diving board. 8/22/18 9:19 AM Fat road tires. Put some 17.5x622 Velocity A23 wheels with fatty tires on the Bike for the cush. While not quite as wide a rim as the Pacenti SL23 which is 18x622, the Velocity A23 sits a 25-28 road tire in meaty fashion. This pic is a 28mm GP4000ii, the 25 and the 28 GP4ks like my 25mm Pro4 Service Course have generous casings for their size. The Pro4 sits 28.5 or more on the Pacenti @ 90 PSI. I had the 28mm GP4K on the SL25 20x622 disc rims and they popped 29mm wide aired up. So thanks Carl 18 years later for the rear tire clearance, well almost. The tire pictured above 85 PSI was just touching the brake bridge at one spot in rotation. So yesterday I did a drop out mod/hack. 3mm JB Weld pad in the crotch of the Breezer style dropout to lower the wheel in the frame just enough. The front was a non issue due to the 384mm axle/crown Kona Steel fork this frame has been wearing since the SS relegation a few years back. Ride report. Between the 2CM taller fork and the fatter tires, the bike exhibits a calmer demeanor, even @ 85/95PSI. Although quick bumps that catch you off guard and seated show the short wheelbase. The hard blips are very tubular like feeling with the latex tubes and these fatties. Tomorrow I may try 70/80 just because. But the idea of the epoxy dropout hack was to make room for higher PSI without the tire touching. 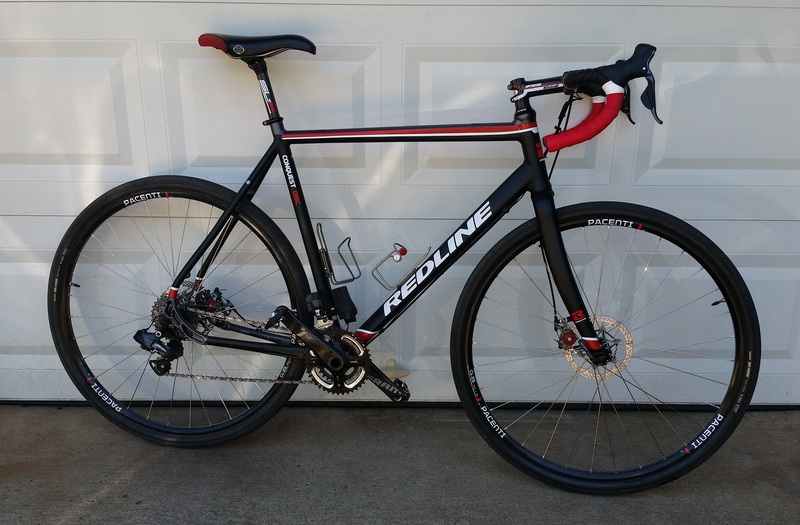 Made a bike outta the Redline Frameset. Ultegra Di2, 40mm Maxxis Refuse tubeless. Until I order the WTB TCS Byway 47x650b tanwalls. 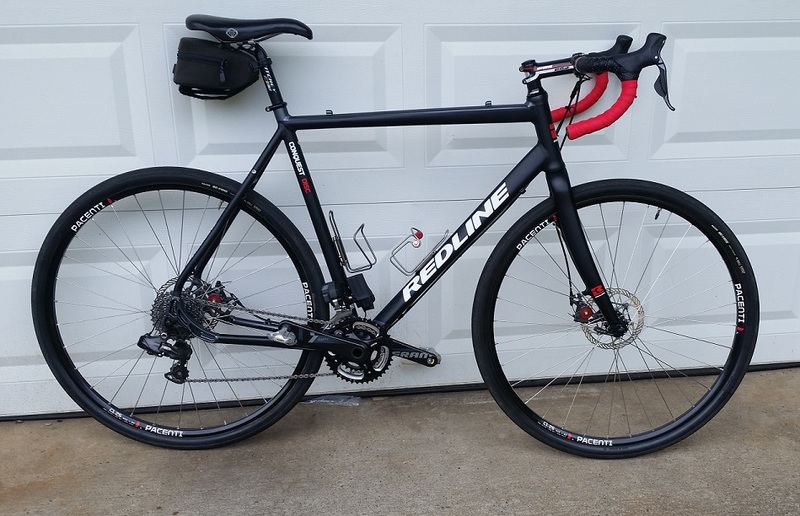 Already had built a 650b wheelset, interested to experience this setup. 28/42 Force Carbon Crankset, Salsa Cowbell # [3?, I forget], 11-32 with short cage, shifts fast and furious. Added some red Vinyl 'redline's here and there. Looks like another good build! I haven't done anything with 650b except for a few mtb's since I don't have any disc-braked road or CX bikes. I picked up this 1960 Ideor Ace a few weeks back and with it's triple and 28mm Paselas I have been able to climb some technical trails on it, even though the pedals are all wrong for that kind of thing (It forces me to focus on not dismounting). "Looks like another good build"
It is a touch big for me, but I kinda like that. ;) Nothing shorter reach bars and a 11CM stem didn't fix.. Zero set back seat post on the way, 0-15mm setback actually. FSA, same as Stem & Headset etc. 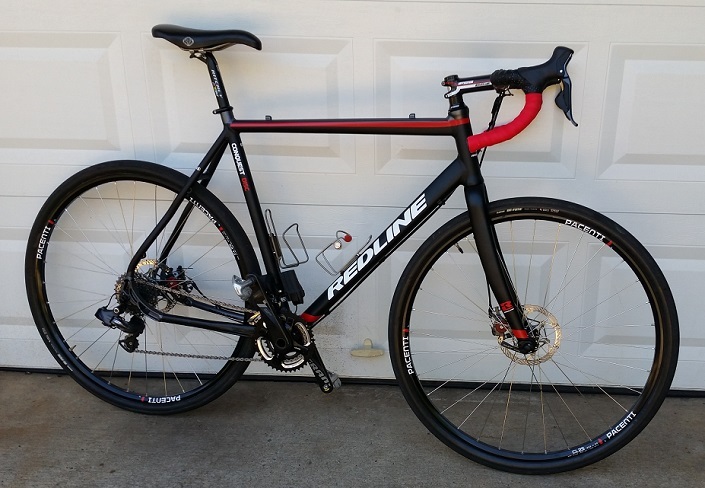 Yeah, seems odd that your Redline had redundant cable housing stops, huge ones at that! I remember my first road bike (1971 Raleigh Record) had top tube cable stops at the 4-O'Clock position on the drive side. So the stops being "a thing" on this old Ideor totally escaped my notice, even as I had to de-gum the rear brake cabling. Previous owner was a detail-oriented PhD who added clear red plastic tubing over the exposed wire and got all of the functional build details right. 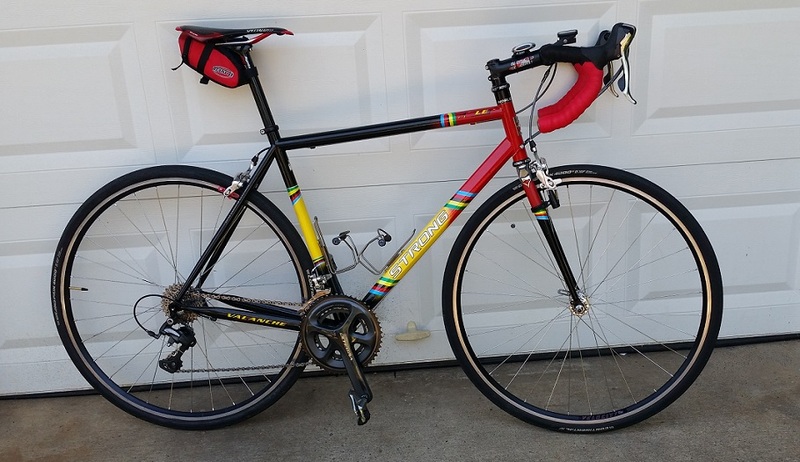 It had a lot of miles and appeared not to have been used in 20 years, yet with the original Campy headset and hubs still spinning smooth as glass. "Yeah, seems odd that your Redline had redundant cable housing stops"
It doesn't. Top stops are for the rear DR, but the Di2 wire is heat shrink tubing-ed to the rear brake run under the DT. There are DT cable stops for the FD, again empty with Di2 with only one wire running to the middle of the bike from the front shifting wise. I have not seen this cfg before, top for RD and DT for FD. But it make sense being the rear is more fussy being indexed, top run/stops and dirt etc.? A lot of these are probably setup in line with the theme of the thread, the original theme... 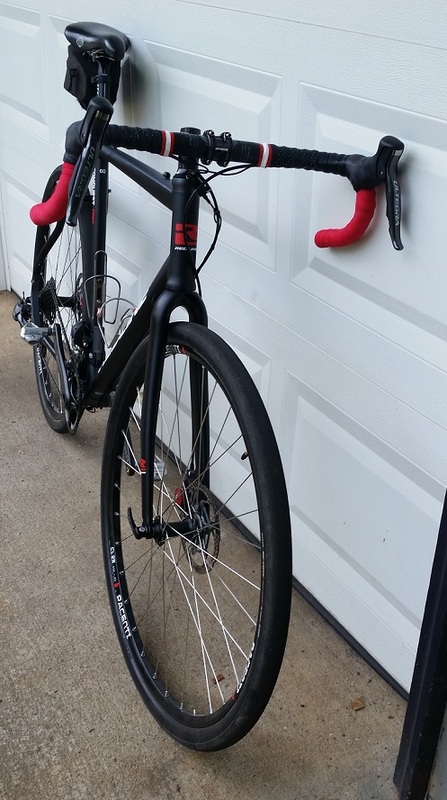 I was going to do 38t Narrow wide with 11-36t but decided the 28/42 would be more versatile and conducive to hills. I had both spider/chainring setups. Just did a woods ride along the river near us. Hard pack deer trails mostly, and some gravel carriage roads. Bike does the go fast thing really well. Staying in the pedals and the geom is point and shoot, I like it. It has a road geom, the fat tire calms it a touch. But 73/73^, 7CM BB drop. Glad I got the 60, the 105CM wheelbase is stable blasting singletrack. The 58 has an 1" shorter WB. Happy to share method of shimergo-ish route and cable housing mods if anyone is interested. It works so well I am leaving the front a 160mm disc. I originally planned to go 180mm up there so I can swap wheels off the Strong. Center Lock is quick and easy to swap rotors. I have no disc 6 bolt hubs/wheels in my stash. I know that there are two versions of the BB7, one for V-brakes and the other for canti and road levers. 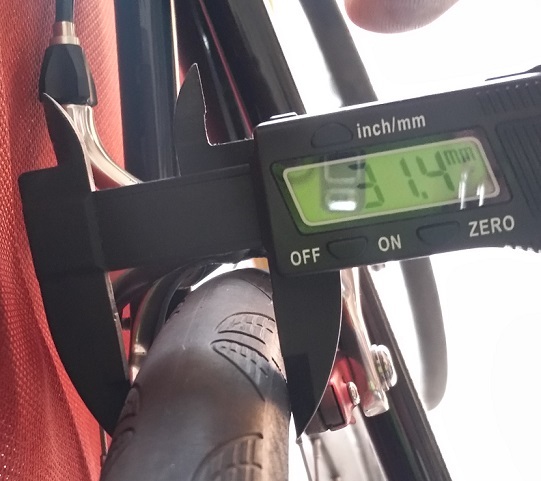 If yours are the V-brake version, it adds weight to the claim of the newer Shimano road brake systems having a longer cable travel with lower-actuation ratio calipers. 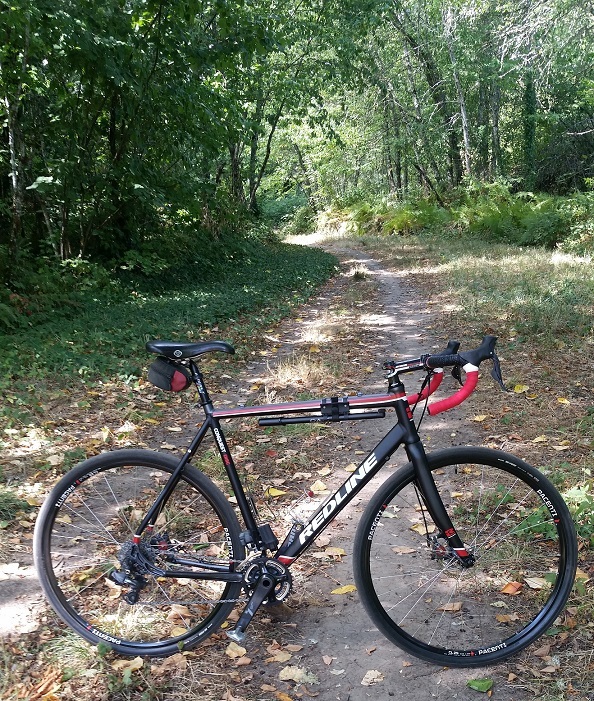 This bike seems to epitomize the more recent trend of making gravel bikes with less of a traditional CX geometry (usually having like a 71-degree headtube). Rather more sporting like a road bike, with the larger tire/rims enabled by the overall disc-brake "architecture" expected to keep things calm. Having the front mech cable going under the bb is perhaps so that a standard bottom-pull road derailer can be used? "there are two versions of the BB7, one for V-brakes and the other for canti and road levers." Yes, Silver= Road, Black = MTB pretty much. I had a MTB set in a box I had not used. The only thing I had to purchase for this build that wasn't sitting here in a box was JAG Compression-less Pro brake housings, and front Swiss Stop Green disc pads. And I probably did not actually 'have to'. But these 2 things embellish cable discs well worth the price of admission. I highly recommend the Swiss Stops on fronts at a minimum. I actually don't like the rear brake to be too good personally. Think Campy front Dual pivot with single pivot rear, I love these on road bikes. "(usually having like a 71-degree headtube)"
Although a lot of trail with a chopper like front end is good for high speed over looser terrain. If anyone remembers in the '00's I was using for a long while the Trek 730 Franken-CXed that fit 45mm Fire-CX tires. My only off road bike for 3-4 years. 71.5 HTA hybrid geom. trail of 7CM. That, to me is approaching 'chopper' for a bicycle, ;) I think the Hybrid generous BB drop also helped me, with my long femurs and inseam for my height. For me the effect of a slacker HT angle is that I focus less on what is immediately in front of me and less on maintaining balance within that field and time frame. With a slacker front end I keep my eyes focused further up the trail, so am visualizing my balance more in the context of where I will be within a longer time frame. The result is that I can swoop through corners (including those with elevation changes) faster, in a much more fluid, comfortable and enjoyable way. I think this is what the magazine test riders are always referring to as a "playful" geometry, which reminds me most of my days riding motocross bikes such as my 250 Elsinore with it's 32-degree (equivalent to a bicycle with 58-degree) HT angle. Noting as I am sure you are aware that a MC's HT angle is conventionally measured off of a vertical plane instead of a horizontal one). In the late 90's I raced XC using the predecessor to your FireXC tires, the Panaracer Smoke45, mounted on sturdy MA40 road rims. I discovered then what everyone knows now, that the bigger diameter worked better off road. "I focus less on what is immediately in front of me and less on maintaining balance within that field and time frame"
That is so very well put IMO, and true. I ride the back of the bike a lot, a habit from a decade + of MotoCX perhaps. I find with too slack a bicycle front end I climb the line pushing into turns hard/fast and just can't get enough weight on the front end to carve as I like to. I shouldn't be going so fast for this to matter anymore, brittle bones et al, but old habits die hard? "250 Elsinore with it's 32-degree"
I do not recall the actual geom, but recall my 'Open' Maico 490 had a crazy steep HTA. Once I learned the trick of how to attack a turn with it [way different than yz125 or kx250] It made short work of sharp berm transitions. ;) I did eventually sell off the open bike and stuck with 125 and 250 for the last few years I diddled. The 490 was like a tractor at a tractor pull coming out of the apex, intense! It could make loam outta hard pack. ;) So you could pretty much carve an apex in the chosen part of the berm. Nothing like a big block 2 stroke. 35 year old CX Pic for sheits and giggles: I rode Open and 250 that day. Note the Jersey, I was all about the Maico in that time. 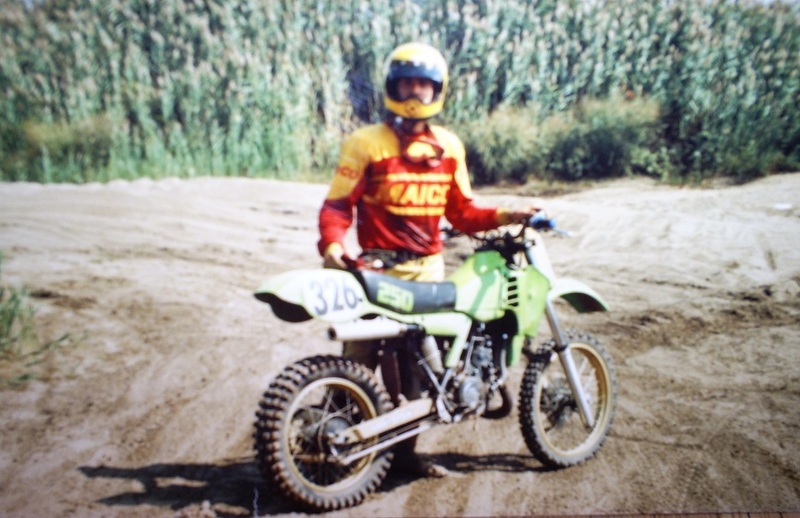 ;) Although that KX-250 changed me as it was light/fast and some newer susp [more] and brake tech for the time. Looks like you had the right tires for the sand track you're standing on. My newest dirt bike was older than that KX, it was an air-cooled, twin-shock, drum braked KDX 250 that had a very smooth engine and transmission, nearly as fast as my late-70's Can-Am MX5. I bought it (used) upon my arrival back to SoCal and had to re-do the suspension front and rear to get any grip on the loose, dry hardpack. Works Performance made big changes (softer) to the spring rate on the shocks they built for me and I ran the stock air-assisted fork but with 0psi in it. "My newest dirt bike was older than that KX"
I neglected to mention the single rear shock, water cooling, and massive fork tubes to go along with early adopters of over a foot of susp travel when I mentioned 'tech'. By that time maybe the assumption was that the stock shock could handle real racing speeds, but I never tried racing with the stock twin shocks that came on any of my bikes! Just like you said, after a few laps even at practice speeds, some washboard or sharp jolt from a rock or a hole would cause the rear wheel to "hop and swap" as the damping had seemingly disappeared. The stock Showa or Girling shocks didn't have any external oil reservoir, nor any damping adjustment. Their shock cooling fins were for show, just good enough to get the bike out of the showroom and for some easy break-in or trail riding. I remember Husqvarna setting new standards for suspension travel (nearly 13") around 1979, and still using 35mm fork tubes. But not surprisingly that lasted only one year as too many of them became bent in use. Quick google, 1983 KX-250 48mm stanchions. IIRC, the 490 Maico had 53mm tubes. Been riding this a bunch, mostly woods trails and open field deer trails. A few MUT jaunts with a little more aired up tires. 2nd; Part of the above may well be the spot on fit for me. 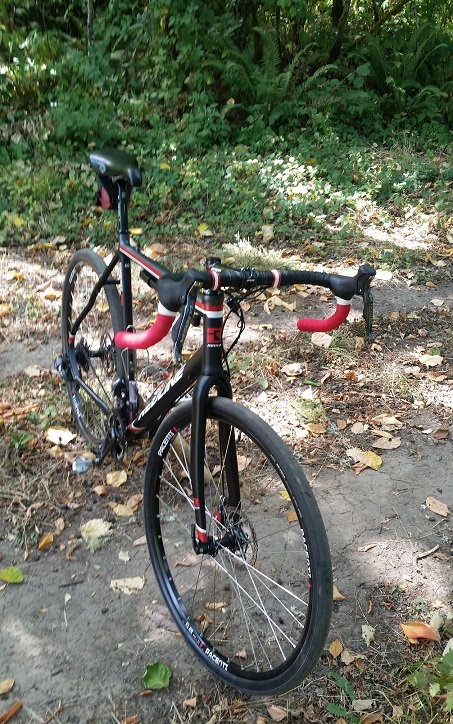 The road BB drop and long chain stays/Wheelbase with stiff frame seem to balance out nicely. Nice steed without a multi $k pricetag. 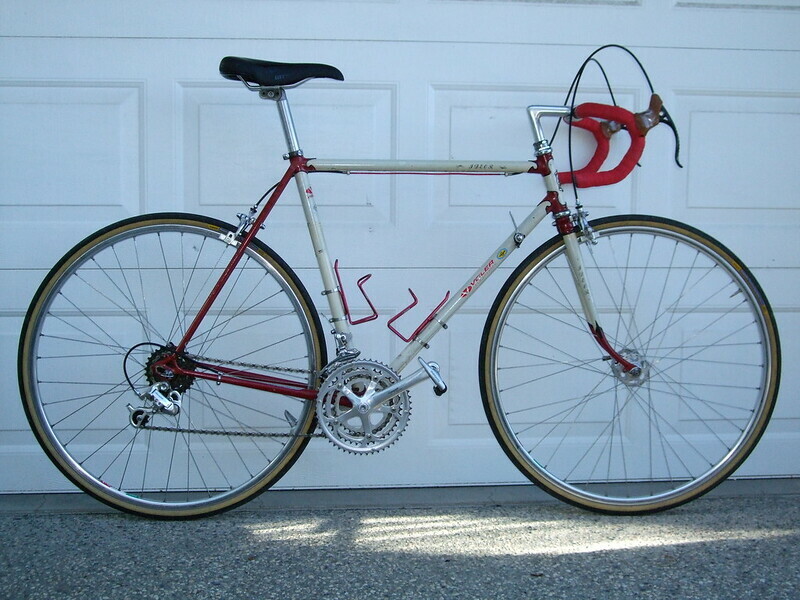 Although I doubt I'd have been interested in the complete Tiagra 10 speed with boat weight wheels. $1599.00 MSRP like that I think. Bike's ride and performance has been a pleasant surprise. Yeah, you can never over-estimate the importance of fit and weight distribution. 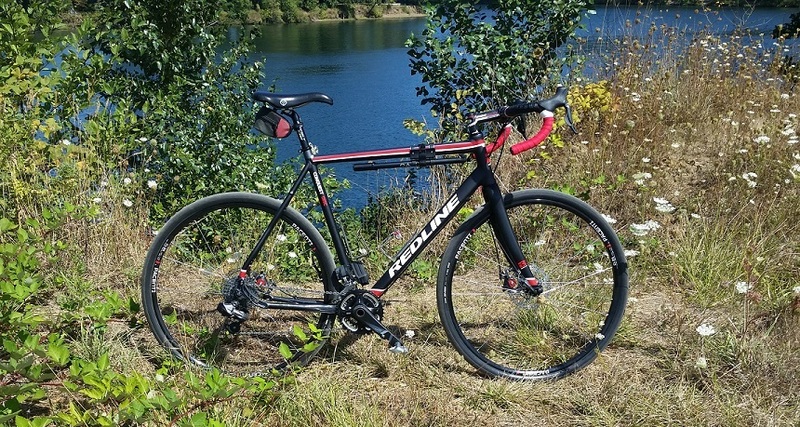 I always say that the disc-braked bikes make the most sense as an all-in deal where larger tires on (usually) wider but still light rims make up for any excess of fork stiffness or even a stiff alloy frame.